At long last, the next trailer for Star Wars: The Last Jedi is on the horizon. 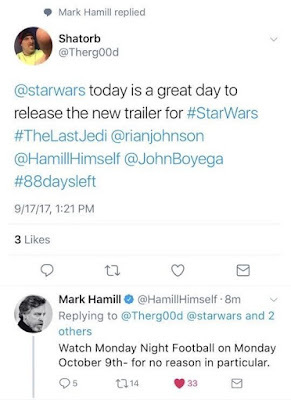 Luke Skywalker actor Mark Hamill teased fans on Twitter, replying to a question about when the trailer is coming by saying, "Watch Monday Night Football on Monday October 9th- For no reason in particular." Hamill has since deleted the tweet (see the screenshot below) and replied to another fan asking about the trailer, "I have no idea. Disney will announce when they are ready. 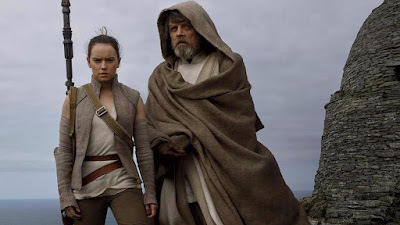 #WaitForVIIITrailer"
It seems that Hamill may have jumped the gun on when Disney and Lucasfilm want to announce that the next trailer is coming. It makes sense for the trailer to be released during Monday Night Football on ESPN, given that The Last Jedi seems to largely be following the same promotional schedule as The Force Awakens (teaser trailer in April, behind the scenes reel at a convention in July). The first full trailer for The Force Awakens debuted on October 19th, 2015 on ESPN during a Monday Night Football game. It seems likely we'll see the next The Last Jedi trailer during a Monday Night Football game, whether its on the 9th or a later week.